Rachel Watts is suffering from recurring nightmares about her near death experience in London. She just wants to forget the whole ordeal, but her boyfriend, James Mycroft, is obsessed with piecing the puzzle together and anticipating the next move of the mysterious Mr Wild, his own personal Moriarty. Things get worse for Rachel when Harris returns to Melbourne with them, but could Harris be the only person who can help her move forward? Then a series of murders suggests that Mr Wild is still hot on their tails and that Mycroft has something Wild wants, something Wild is prepared to kill for. Rachel and Mycroft have both returned to Melbourne, after the harrowing and traumatic experience in London. The police may have their abductor in custody, but it's the mysterious and dangerous Wild that has the two teens on edge, they have something he wants and he isn't afraid to make his intentions known. But Mycroft's insistence at keeping in touch with Wild is only fueling Rachel's fears. Her nightmares have drove her to escape the city with big brother Mike, back to Five Mile to clear her head and evaluate her relationship with Mycroft. But Mycroft has a lead, and is determined to see this case through, taking off to Bali to find one of his father's most trusted colleagues. When Rachel returns to the city, it's clear that Wild is closing in when a young man's body is found, resembling Mycroft and his injuries he sustained at the hands of Wild's henchman in London. But while Mycroft is chasing his lead, Rachel begins to fight back with the help of Harris, Mike's flirtatious and attractive best friend. As Rachel reclaims her power, Mycroft returns, Wild is on their doorstep and it seems that even escaping to Five Mile isn't safe. 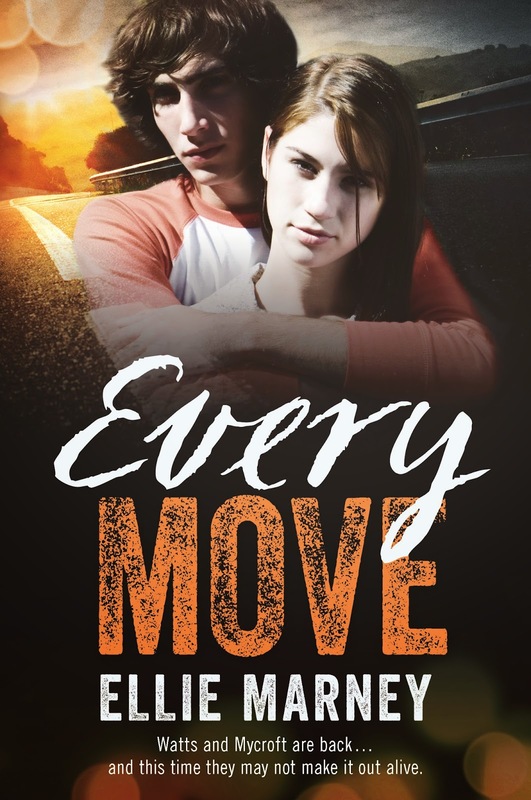 Every Move is everything you want in a series finale, suspense, intensity and brilliance. Ellie Marney has crafted yet another heart stopping storyline that follows our favorite crime solving couple, Mycroff and Watts and this time, it's personal. Every Move picks up in the middle of the London aftermath, Mycroft is still in contact with Wild unbeknownst to the police, and Rachel has now distanced herself from their relationship. After being captured and tortured in London, it's not only the nightmares that traumatise her each night, but the fear of being held or physically restrained, something Mycroft doesn't seem to understand. He's blinded by his search for the truth, and allows his relationship to suffer. We're introduced to a new character in Harris, Mike's best friend from Five Mile and local ladies man. It soon becomes clear that behind the flirtation, Harris is interested in Rachel and her well being. But Harris knows all too well what it's like to feel defenseless, and is determined to help her take control of her life once more. When Mycroft returns from chasing down a lead in Bali, the tension and banter between he and Harris is nothing short of delicious. I adored Harris, he was competent, tenacious and left me torn between wanting Rachel to pursue a relationship with Harris, and the ever increasingly abrasive Mycroft. It only added to the tension. Well played Ms Marney. Well played. Simply the most engaging, character driven and thrilling contemporary series I've read thus far. It's utterly brilliant. Ellie Marney knows how to create a tense and suspenseful storyline that will make you ache for justice. The flawed characters only add to how endearing not only Mycroft and Rachel are, but Rachel's family and friends as well. What sets the series apart is that it's not complicated, there's no excess teen drama angst, no love triangle and no instant love. The emphasis is on family and the family unit for support. If you've yet to pick this series up, you definitely won't be disappointed. I've absolutely loved it, and the only downside being that the series is now over and I'm not ready to say goodbye. It's brilliant Frannie, I have no doubt how much you'll enjoy it. It's just so engaging and wonderfully written. You'll fly through them too Lauren, they're so easy to read and immerse yourself in. It's been one of my favourite series so far. It's the best of the series, but only just and seeing how phenomenal the other books are too. I'm really sad to have to say goodbye to Rachel and Mycroft, I found myself so immersed by both of them, that I almost feel like they're friends of mine. Not gonna lie, I'm kinda rooting for the flirtatious ladies man. After the horrendous adventure Rachel has been through, and Mycroft's seemingly oblivious disposition about it all, I wish Harris steals the girl. Lol. I was hoping that at one point too Joy. Mycroft was being so abrasive and really didn't take an interest in anything other than finding the truth about his parents and their accident. Rachel was struggling, and Harris was a delicious distraction. I loved his character and secretly hoping he might have his own spotlight soon too. Hint Ellie Marney, hint hint. Pretty much every review I see of this book is positive. Which only makes me, like 10000x more excited to read it. As I loved the first two in the series I'm sure I'll love this. Though it will be sad to say goodbye to the characters, that's for sure. If you loved the first two Kara, this one will absolutely blow you away. It was brilliant. Thanks Jess. It really was wasn't it. One of the best I've read. Even though the situations are completely fictional, one of the aspects that drew me in were the character relationships and how realistic they were. Between parents and child, friends, partners. And that no one was painted as being perfect, anything but really. It made them much more endearing and relatable. You really need to pick up this series Benish, it's Aussie young adult at it's finest. Eep I've had to skim this because I haven't started this series...*hangs head* I'm so glad to hear that you loved the concluding book! I always get really nervous about the last book because of a slight fear that it will not end the way I need it to. :P I'm liking the sound of Harris even though it sounds like a potential love-triangle. I better get cracking with this series hey! Me too Joy. I think that's why I tend to let all those series finales build up and usually wait until the hype dies down. But I needed to read this one and couldn't wait. Ellie Marney definitely didn't disappoint. When the boyfriend meets the flirty guy = irresistible tension. Now you're making me want to read this series more, Kelly Bear! And, I'm in it for the suspense, too. But mostly the romance. ;) Lovely review, girl! The romance is incredible Aimee, a delicious and intense slow burn with two of the most shippable characters in young adult. This series will knock your socks off, I have absolutely no doubt. I am definitely not ready to say goodbye to this series, either! I'm really just hoping that we get a Wattscroft cameo in the book(s) about Harris that Marney is writing! I really liked Harris, and I must say the chemistry between him and Rachel was quite intense - but there is and only ever will be Wattscroft for me. They just compliment each other so beautifully, and I love the way they really and truly care for each other. I definitely agree with you that the simplicity of this series is one if its strongest suits, because it really just focuses in on what's important. Is she actually writing them? Ohhhhhhh. I hope it's an actually thing, that would absolutely make my weekend if she is. I loved Harris too, and was really torn and wanted he and Rachel to give in at one point. I'll be Googling like mad to see if I can find anything about Harris' story.